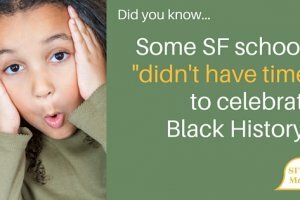 With Black History Month upon us, I thought I’d put together some more ideas for families, educators and social justice activists interested in addressing race, slavery and anti-blackness with young children. Stay tuned for more posts in this series and feel free to write me a question in the comments. I may choose to write about it in a future post! I am so happy for all my school is doing in regards to creating an even more caring and welcoming school for kids of all backgrounds and identities. Our teachers are working with the Literacy specialist to develop book lists of high-interest, age-appropriate books to add diversity to our classroom libraries. She is also working with the school social-worker to push into classrooms a Book-of-the-Month reading program highlighting themes like empathy, inclusiveness and racial identity. As I mentioned in a previous post, it is not developmentally appropriate to focus conversations on the harsh realities of slavery with very young children (kids earlier than 7 years of age.) At the same time, it is not advisable to avoid conversations about race either. Instead, researchers and educators recommend that we start talking with young children about race and difference as early as preschool to support a healthy development of identity and appreciation of people who are different. 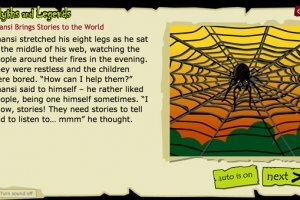 The following is an excerpt from Anti-Bias Education for Young Children and Ourselves a book which offers practical guidance to early childhood educators and parents about ways to address prejudice, misinformation and bias about personal and cultural identity. Derman-Sparks and Edwards recommendations align with my experience in talking about race and identity with my own kids. At a very early age, kids are not developmentally ready to understand race/ethnicity as an abstract social construct. There is a lot of evidence however that kids as early as 6 months old DO notice physical differences and start to assign value based on the ways adults interact around race. A good place to start talking with young children about race is to encourage them to celebrate and admire sameness and uniqueness. Derman-Sparks and Edwards explain how celebrating physical diversity is beneficial to children developing a positive self-identity and appreciation of others — highlight with kids how all colors, shades, and shapes of people are beautiful. (Check out the first three books on this list to get you started!) And just as you would teach a child to say “please” and “thank-you” or to value sharing, you have to model and initiate these types of observations and conversations. Start with understanding similarities and differences within your family or cultural group, then expand to appreciate similarities and differences within and between cultural groups. Use these conversations to teach them vocabulary to talk about physical differences in respectful ways. The authors also caution teachers not to single out one particular child. Talk to any Black (or other child) that was “they only” in his/her class and you will hear stories of how this often well-intentioned act can be stigmatizing. Instead, focus on every child’s racial and cultural identity. Even in groups of children where there seems to be little diversity, there are always opportunities to look for sameness and differences within cultural groups. Sometimes a child will do a self-portrait and choose a color different than their own. I saw this when working for the East Harlem Tutorial project for an early education program. Many of the children painted portraits of themselves as light-skinned when they were actually beautiful shades of Black and Brown. In order for kids to have positive self images, they need to see their skin tone and hair/eye color as beautiful. And make sure you have art supplies to include children of all skin-tones. If you are White, think about what it would be like to try to draw yourself or your family as a young child when the only color for “skin tone” in your crayon box is peachy-tan. Conversations about race are a great way to cultivate empathy. Share personal stories (age appropriate of course!) about times you have faced unfair treatment. Or share stories of others through movies or books. For example: the Ruby Bridges story is a great way to discuss fairness and inclusion/exclusion. And don’t just focus on the victim of bullying, make sure to highlight allies as well. Ruby Bridges would not have been successful if it were not for her White first grade teacher or the federal marshal that walked her to school each day! Use race to foster problem-solving skills. Read a book and ask questions, or act out a situation with dolls. How does it feel to be excluded? What could you do to help your friends if they feel left out? When you see someone being treated in an unfair way, what can you do to help? These are great real-world opportunities to foster an interest and willingness to help others. Provide constructive reframing when kids demonstrate stereotyping. I was shocked when my girls asked me: “Why are all homeless people Black?” I didn’t know what to say. It’s an unfortunate fact that MANY of the Black people I see in my mostly White neighborhood are people of color. It’s important to both acknowledge these observations and also challenge them. I told my girls it is very common to see homeless and income Black people in our city because our society has many racist structures in place that make it hard for Black people to get ahead. At the same time, there are also many successful Black folks out there (the girls’ grandpa, and cousins for example!). Unfortunately, Black folks are underrepresented in movies and TV shows. One easy way to expose kids to non-traditional stereotypes is to diversify your bookshelves, your toy chest, and your child’s coloring box. Be intentional about countering stereotypes. Model active resistance to racial bias. You are never too young to take action! Talk with your kids about times you stood up for what was right. 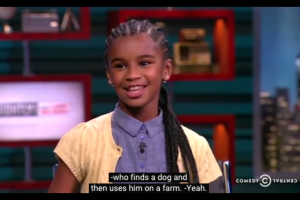 Read about Marley Dias, an 11-year-old girl who is launching a book drive to increase books with Black girls as lead characters! It is important that children learn they can take an active role in making the world a better place. Support and model for children ways to turn “unfair” situations into “fair” ones. And make sure to help them see that they do not have to take on social change alone. All of the civil rights heroes took action with others. When we work together we are more successful, more supported, and we have more fun! 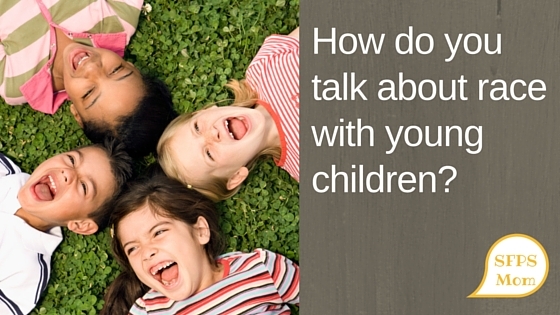 How are talking with young children about race and bias? What recommendations do you have to share? What Color Crayons are in Your Coloring Box?